Identify potential new programmes that respond to UK and international needs, doing so in a way that complements existing British Council activity and beyond, responding to needs of related partners and audiences. 1. Production of an online publication analysing distinctive strengths and examples of creative hubs in 12 core cities in UK as centres for new enterprise, leadership, culture and collaboration. In doing so, present their economic, social and civic impact and contribution to creative practice, education and the wider creative economy, particularly to UK regions. This should include reference to job creation and economic contribution where possible. This should be written and designed in a way that is accessible and visually engaging to a wide range of professional audiences in the UK, in addition to international policymakers and practitioners. It should draw on, collate and reference existing data as much as possible, rather than duplicating. 2. To work with British Council and another appropriate, high-profile agency to communicate this work effectively. (Please identify potential agencies or platforms in your application). 3. To identify assets and resources within these hubs that could be internationalised in ways appropriate to British Council's mission, to include leadership, finance tools and other training resources, showcasing opportunities, policy exchange, digital co-production, skills provision, and member businesses. This will be used to inform ongoing strategy of British Council. 4. To engage and fuel a dynamic network of hubs so that they are more aware of international opportunities, as well as those agencies that support them to advise on research guidelines for best practice for mapping and related research in hubs overseas. 5. To include participatory, open processes including workshops and contributions from a diverse range of hubs and supportive agencies to use content, language and style that is relevant to both hubs practitioners and policymakers. Please submit a short proposal of how you would approach this, detailing a timeline, budget and your relevant experience (and that of your team if relevant). We are particularly interested in how this might link to other (public or private) agencies and complementary pieces of work for combined greater impact and engagement. The budget is around £20,000. The deadline for the completed piece of work is the end of April. There is some flexibility but there should be some information available to be presented by end of March. Deadline for expression of interest is Thursday 25th February. We will endeavour to schedule phone interviews the following week. 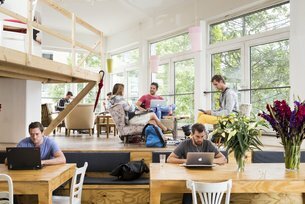 Over the past few years, hundreds of co-working spaces have emerged around the world, allowing people from a diverse range of disciplines to connect for resources and investment, while learning to test new ideas and ventures. Many involve creative professionals and seek to support new forms of creative enterprise, practice and skills. For more on recognising hubs as important spaces, read here. But creative hubs are often isolated and in the early stages of development and struggling without sufficient support, there is limited research about their effectiveness and specific needs. They often consist of a diverse number of organisations and in having quite different motivations and approaches there is a need to develop business models, sustainability, advocacy, training, international and national connections. The Creative Economy team has been working with a number of global hubs. More can be read about these here. In collaboration, we developed a free hubs toolkit here. British Council is committed to improving its visibility, reputation and impact across the UK, through a two-year UK City Engagement Programme that works across education and culture sectors and other stakeholders through a more integrated approach for key UK audiences. The key cities are: Birmingham, Bristol, Leeds, Liverpool, Manchester, Newcastle, Nottingham, Sheffield, Edinburgh, Belfast, Glasgow, Cardiff. Find out more about British Council Arts strategy here. Find out more about British Council Creative Economy programme here.